Lovely, lyrical works for your reading pleasure. 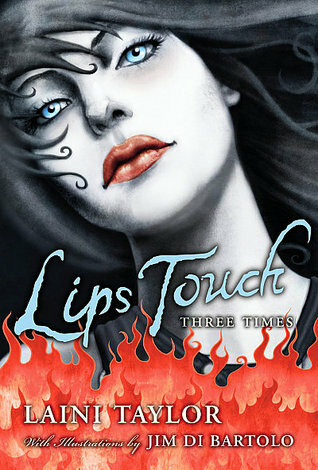 LIPS TOUCH THREE TIMES, Laini Taylor. A fabulous trio of stories, all pivoting around a kiss and its consequences. There are goblins, demons, and fanged men, all seeking to entice girls and snare their souls—and the surprising resistance they encounter. Written with Taylor’s usual grace and style. An example: There is a certain kind of girl the goblins crave… girls who dream so hard about being pretty their yearnings leave a palpable trail, a scent goblins can follow like sharks on a soft bloom of blood. The girls with hungry eyes who pray each night to wake up as someone else. Urgent, unkissed, wistful girls. A National Book Award finalist, with wonderful illustrations by Jim DeBartolo. Five books set in the magical world of Lyra. 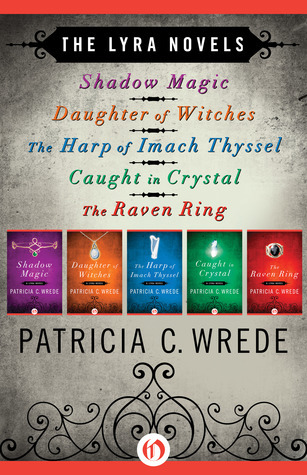 These are Wrede’s earlier books–fantasy with happy endings–good, but not as great as her later works. Nevertheless, Wrede is a great world-builder and has a wonderful way of drawing you into her stories. Shadow Magic – Princess Alethia is kidnapped by a man with a face made of shadows and taken to magical woods. To escape and save her kingdom, Alethia must look for answers in old legends of sorcery and daring. Daughter of Witches – Ranira’s parents were burned at the stake for practicing magic. Now she’s an indentured servant for a brutal innkeeper and keeps her own abilities hidden. But when three strangers show up at the inn and try to help Ranira through sorcery, she’s forced to unleash her powers to save them. The Harp of Imach Thyssel – Emereck, a trained minstrel, and Flindaran, a nobleman masquerading as a tramp, stumble upon a long-abandoned castle and one of Lyra’s most sought-after treasures: the Harp of Imach Thyssel, said to possess the power of life and death over all mankind. To keep it from falling into the wrong hands, Emereck must harness its strength to create and destroy. Caught in Crystal – Kayl, a sword-wielding former member of the Sisterhood of Stars, knows all about the Twisted Tower, where something terrible is bound with a magic spell so that it can never escape. She left the order and settled down to a quiet life as a country innkeeper, but now something evil is leaking from the Tower and Kayl is called upon to take up her sword again. The Raven Ring – After Eleret’s mother is killed in battle, she sets off to recover one of her mother’s prized possessions: a ring etched with a raven that is a talisman of power against an ancient enemy, the Shadow-born. But someone wants the ring badly enough to kill for it, and Eleret must unlock its mysteries to survive. 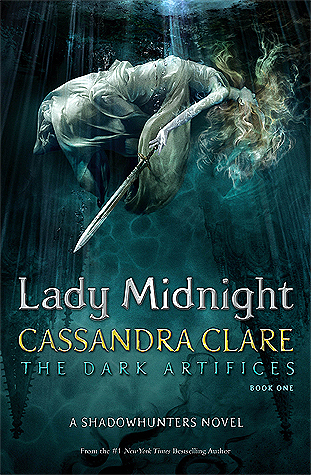 LADY MIDNIGHT (The Dark Artifices #1), Cassandra Clare.